Every summer, my personal food choices seem to degenerate into a category best described as “some things on a plate.” I don’t know if it has more to do with bountiful produce, bountiful heat, or bountiful laziness, but it happens, and it’s happened every summer since I was a child. Perhaps it’s embedded in my genes, because everyone in my family seems to be afflicted. I suppose “degenerates” is a bit harsh. Summer may exemplify food at its most honest point: bare, largely uncooked, with bold flavor and color all over the place. We don’t seem to care much, either: we scatter herbs, rough-chop vegetables, shove meat on a stick and grill it until whenever, and make pitchers of drinks because who has the energy to make individual cocktails? No one. Galettes abound, because they are the embodiment of how summer feels: golden, flat, and sweet. Also, everyone seems like a rustic Kinfolk hipster when they trot out a freshly-handcrafted galette at a dinner party, but that goes without saying; extra cool points given if the fruit comes from their own garden. Whatever the reason, Things on a Plate is in full swing here at the abode. Soon enough, it’ll be autumn, which – for me – squishes me back into my very comforting and welcome routine of preschool delivery and pickup, writing, some house projects, and weekend football on the television. I will see less things on plates and more actual thought-out meals, and I will eat at normal times again, mostly because I won’t keep doodling around because it’s still light out and then realize that it’s 8:30 pm. 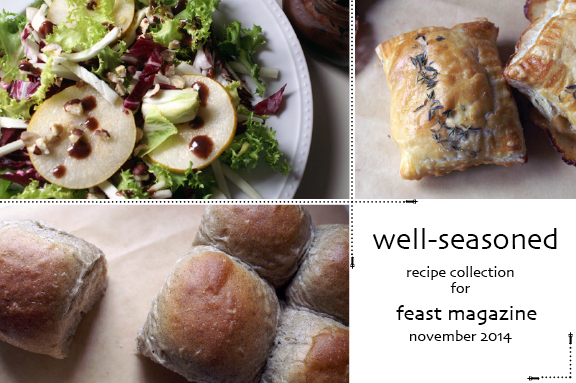 Before all that happens, I thought I’d share some ideas for things on a plate with you. Neither of these need to be strictly followed: they hopefully serve as foundations for you to build on, or as inspiration for other things you could assemble. These follow, I imagine, some basic universal rule of what humans enjoy: greens with a little vinaigrette thrown on them, vibrant fruit, crunchy nuts, creamy cheese, perhaps a little meat, and some crusty, toasted bread thrown in for good measure, and maybe a little drizzle of flavor to finish the whole thing off. Sure, you could meticulously craft a salad from all that, but why, when you could just throw it on a big (or some little) plates and have at it? I know what I’d rather do. First up, the fig version. What you see before you is some crusty sourdough (I have a thing for it) alongside baby arugula tossed in a simple vinaigrette. 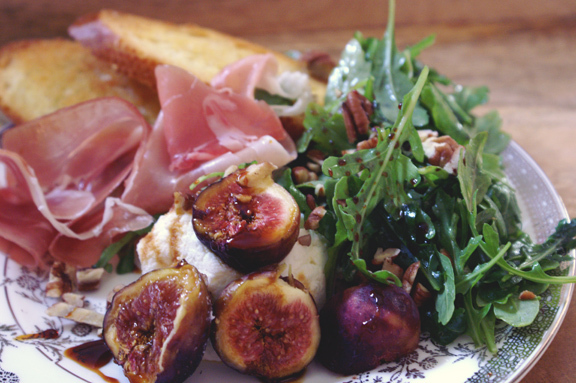 A generous scoop of fresh ricotta, some ribbons of proscuitto, fresh black mission figs, and some toasted pecans surround it, and the whole thing gets drizzled with a little molasses and seasoned with a wee bit of sea salt and fresh pepper. Now, you could do anything with it from there: add and subtract as needed, or make substitutions based on what you like. Crisp that pancetta, swap regular molasses for pomegranate molasses (delicious; try it), let goat cheese stand in for the ricotta, or try walnuts – even hazelnuts – instead of the pecans. Give it a more savory bite by making a Dijon vinaigrette versus a straightforward vinegar/oil version. Whatever. Next up, the apricot version. 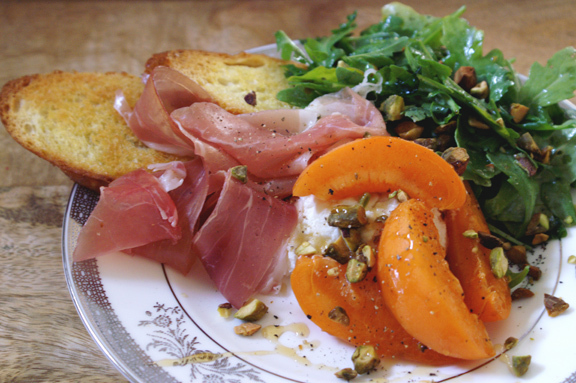 Same bread, vinaigrette-slicked arugula, salty proscuitto, and creamy-soft ricotta, but with fresh apricots, chopped pistachios, and a little honey over top. Pomegranate molasses would work nicely here as well, if you wanted a little tartness, and pine nuts would be delicious as a stand-in for the pistachios, as would pecans or walnuts. Or maybe the vinaigrette takes on the pomegranate molasses and you leave the honey as/is; a lemon vinaigrette would do nicely as well. Again, whatever you want: it’s your thing on a plate. And as I mentioned above, this can be on one big platter versus individual plates, and that just makes it easier for you to assemble; pile things in bunches and let everyone dig in as you sit around the table and chat. Conversational pairing for these? Try discussing how quickly summer seems to have gone, and how much you’re going to miss it, but how much you’re looking forward to fall at the same time; this food and that discussion go hand in hand. each version makes approximately 4 servings. and remember: this recipe is made to be messed with, so play around with some of the things I suggested above, or create your own whole new thing. *toasting bread sliced depend entirely on the bread itself, so consider these rough guidelines. Lightly brush your bread slices with olive oil, season with a little salt and pepper, and place in a pre-heated 400˚F oven for 5 minutes or so. Check them; if they’re not getting golden underneath, leave them in for a few more minutes. Once they’re almost how you like them, flip them over and toast for a few more minutes. **grilling depends on both bread and grill, so I’m winging these instructions. Brush your bread slices lightly with olive oil and place over indirect heat on your grill for a minute or two until you start to see toasty grill marks. Flip and repeat. Simple: Add the vinegar to a medium bowl and grab a whisk. As you whisk the vinegar, slowly stream in the olive oil until the mixture emulsifies. Season with salt and pepper to taste. Set aside. As I said above, this works great when plated individually or on one big platter, family-style; use my photos above as a rough diagram of how you want things to be, but there’s no right or wrong here. 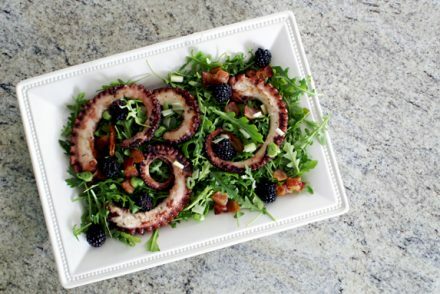 First, toss the arugula with a few spoonfuls of the vinaigrette, until the leaves are slicked but not soggy. Lay on the plate(s). Add the proscuitto, ricotta, and fruit of choice to the plate(s), in whatever manner you choose. Sprinkle the nuts over top of the whole thing. Alternatively: make sections for the nuts, or just sprinkle them close to the cheese and fruit: depends on what everyone likes. Drizzle everything with either the honey or molasses, tuck the bread slices around it all, and season with sea salt and fresh ground black pepper. Serve immediately. 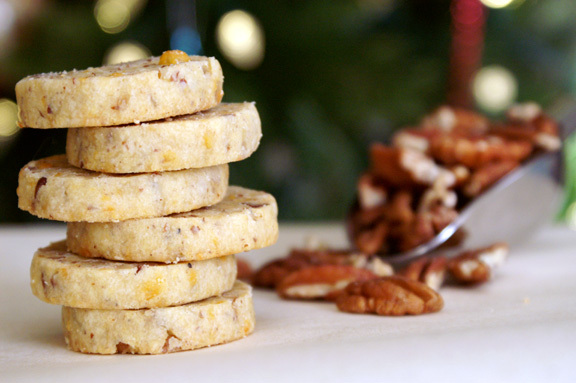 monday bites: cheddar + pecan crackers. I love it – things on a plate! It perfectly describes summer eating. And it may be why I am having such a hard time finding things to blog about. The whole things on a plate thing, and the attitude that goes along with it: it’s summer, why would I go to the effort to craft a blog post, complete with pretty pictures and recipes? Thanks for making the effort. And what an effort! The plates are gorgeous! We are so doing these next weekend. Probably with a few variations, but it is happening at this house. Thanks for the inspiration! thank you! and you’re welcome for the inspiration; enjoy the produce, because all that lovely produce will start to wind down in a few weeks, and it’ll be sad. you know, Sue, i’m a fall girl myself, but yes: the fresh fruits and produce which come along with the hot summers make it (mostly, although i have my complaints) bearable, for sure. Things on a plate sound like a wonderful dinner idea after a busy day, no matter the season! 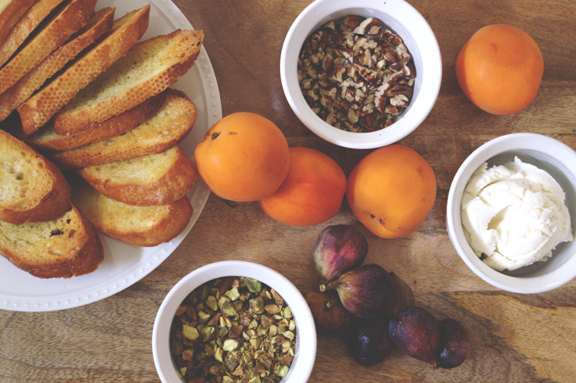 The apricot-pistachio version with arugula has my undivided attention, just magnificent! Agree! and apricots, right? I can never get enough of those in the summer. Thank you! That’s exactly the way I like to eat! I could eat like this every day, and sometimes I do!!! I love things on a plate! And I particularly love the apricot plate you have put together … I love each of these things individually, but combined together? Things on a plate heaven! And now I want a plate of this for lunch. And I’m stuck at work. CURSES! And thank you: that apricot plate is something i could eat all year long: such a shame that apricots can’t be some sort of magical year-round fruit, you know? Such a short little season they have. Get it all into my mouth, right now, please. Also, “things on a plate” may be seasonal. Things on toast is year round. As is things on yogurt, at least for me. Yeah, we do things on a plate, too, and not just in the summer. 😉 But we do it much more often in the summer, I must admit. I rarely put figs on a plate for some reason, however. I need to! Fun read — thanks. Things on a plate is seasonless here, as well: maybe to a lesser degree in the winter, or maybe just cobbled together in a different way, but we do it, and we do it repeatedly, no matter what time of year it is. You know, i’ve noticed that figs are sometimes hard to come by here in STL: for instance, last year i barely saw them, and they weren’t that good. This year, i saw them in much larger quantities, but only at certain grocers. Maybe it’s just not as natural to those of us in the midwest? I would eat the heck out of either of these plates! Our fig tree is loaded right now so I’m in heaven (as are the mockingbirds I have to fight with to get some!) So good! And anytime I don’t have to actually cook something in the summer I’m all for it. I’m so not ready for pumpkin flavored everything yet. Sigh. you have a fig tree? Hopefully you have a guest bedroom too…just saying. I’m visiting. Lunch is the perfect time for Things on a Plate! it’s fast, no dudes around to spoil it, and it’s better to eat lighter for lunch anyway, because then no one falls asleep at their desk immediately after. It’s like the perfect lunch, really. Things on a plate would be a great name for a blog or a book. You aren’t trying to tell us something, are you? I had things on a plate tonight but I like yours better! The days are getting shorter and I still have a lot of plates left to make! Ha! So true, Abbe: in fact, i feel like there may be a cookbook out there with a similar name, now that you say that. I’m googling…i want to say it’s like Three Things on a Plate…possibly a british author. The days really are getting shorter: i’ve noticed that myself, but we are still brimming with fun produce options for Things on a Plate, as i’m sure you are. 🙂 Enjoy! THINGS ON A PLATE! too bad it’s been two months since you did this; i’m awesome, obviously. 🙁 argh. you know what’s even better than steamed corn? CHARRED CORN IN A SKILLET. i yelled that b/c it’s how i feel about the flavor. you’re too sweet, Katherine. thank you. Wow, that plate looks absolutely perfect. It could have something to do with the fact that I’m craving cured meats like nobody’s business. It will be my first meal upon pushing this baby out. God, those apricots look incredible. I’m seriously drooling over here…. Thanks, Amy! Cured meats are delicious…they say pregnancy brings that out in people, in terms of meat. I think it has something to do with the protein and how much your body tends to want that, especially in the last months of it. I know: apricots, right? I hate it when they leave for the year…i want them all the time.